As a local Bend DUII attorney, I often get a number of the same questions about DUIIs. 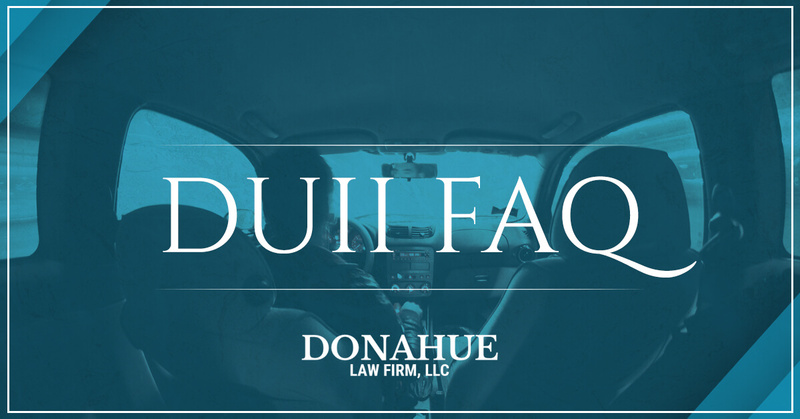 Please keep in mind that while the questions and answers in the Oregon DUI FAQ are intended to be informative, there is truly no substitute for hiring a well-qualified DUI lawyer. If you, or someone you care about is in need of a local attorney in the Bend, Oregon area, contact the Donahue Law Firm at: 541-241-6657. Oregon DUI FAQ: What’s the difference between DUI, DUII, and DWI? A: Nothing really. Different states or jurisdictions simply use different lingo. In Oregon for example, an arrest of this type is technically termed Driving Under the Influence of Intoxicants (DUII in Oregon, see ORS 813.010). Despite the proper term, you will see DUI and DUII used interchangeably, even here as it helps people find the information they are looking for. In Washington State, the charge is simply Driving Under the Influence (DUI in Washington, see RCW 46.61.502). Other states (such as Texas) use the term DWI, or Driving While Intoxicated. No matter how you say it — DUI, DUII, or DWI — it all means the same thing. Q: What will happen if I refuse to take a DUI breath test? A: Oregon DUI law includes the Implied Consent Law, ORS 813.100. The statute provides that if you drive a vehicle on premises open to the public, you have given your consent to have a test taken of your breath or blood, e.g. the breathalyzer. Since the early 1980s, Courts have long held that you do not have the right to refuse a breath test. Why, you ask? In short, the Court has long held that because alcohol levels in the blood can dissipate relatively rapidly, so long as the officer has probable cause, there is no constitutional right to refuse a DUI breath test. Consequences: If you are found to have refused a DUI breathalyzer or breath test, in Oregon, the first thing you’ll face for is a mandatory loss of your driving privileges for 1 year. In addition you will not be eligible for a hardship license for at least 90 days, and possibly up to 3 years if certain factors apply to your situation. However, there can be grounds for defending a supposed refusal. Not every DUI refusal, really is a refusal. As an example, if a person lacks the physical capacity to submit to the test, a successful defense may be possible. Oregon DUI FAQ: I refused the DUI breath test and then changed my mind, but the officer still counted it as a refusal. Can they do that? A: In short, yes. An officer may allow a person to blow after initially refusing. However, the officer is not required to do so. See State v. Kirsch, 215 Or App 67 (2007). Accordingly, if you refuse, you may lose out on the opportunity to provide a sample. Prior to giving a sample, you do have the opportunity to call an attorney and seek legal advice. Of course, if you’re reading this after the fact, this offers little solace. Q: What is an implied consent hearing/DMV administrative suspension? A: After an arrest for DUI, Oregon can suspend your license administratively. This means without even having been found guilty, the Department of Motor Vehicles (DMV) can suspend your license following a mere arrest for DUI. If it is your first DUI, the suspension period will likely last 90 days. If you refuse, your license will be administratively suspended for an entire year, or longer. Prior to the suspension period, you are entitled to an administrative hearing or DMV Hearing. You, or an attorney acting on your behalf, must request an administrative hearing. It doesn’t just happen. You must act quickly to request a hearing or your license will automatically be suspended. It sounds like a scare tactic to say that, but it is very true. Too many clients come to our office having not read their paperwork, only to find the time period to request a hearing is long passed, and they are now facing a 3-month suspension. Keep in mind that just because you were arrested for DUI, does not mean your license will be administratively suspended. There are specific procedures that must be followed and specific additional requirements that apply to an administrative suspension that do not apply to an arrest for DUI itself. Knowing those factors, and how to raise them before the administrative judge, is just part of the services our firm provides. If you have an implied consent hearing coming, or need to schedule one, contact our office. We are happy to schedule the date of the hearing and we regularly conduct administrative hearings for our clients. Please keep in mind that Oregon DUII law can and does change at any time. While we make efforts to keep only the most up to date information on our website, and on this Oregon DUI FAQ page, the current state of affairs may have changed. It is always best to speak with a well-qualified attorney regarding your rights and your unique situation.